Pokemon Go was released on 6th July, 2016 in US and other few selected countries. It took merely few hours for Pokemon Go to become viral. Within a snap of moments Pokemon became immensely popular. The servers of Pokemon Go were flooded with tons of request to play the game. Needless to say people started facing difficulty in playing Pokemon Go as the servers went down periodically. It became a problem for many as they would often encounter Pokemon Go unable to authenticate error. We are here to fix this Pokemon Go unable to authenticate error for you. 1 What Is Pokemon Go Unable To Authenticate Error? 2 How To Solve Pokemon Go Unable To Authenticate Error? What Is Pokemon Go Unable To Authenticate Error? In order to be able to catch Pokemon, you need to to sign up with Pokemon Go after starting the app. But, many people are experiencing various issues with Pokemon Go. Some are fighting the GPS signal not found issue, some are trying to solve failed to detect location. Both the issues can be solved single handedly and you can check out solution for the same. Some have even reported that they see a page which displays Pokemon Go servers are down. So what now? We can certainly not solve the server issues being the end users. But, those who are receiving an error of Pokemon Go unable to authenticate, we can try to resolve the issue. Till now, all the people whom we have a suggestion a solution for unable to authenticate error in Pokemon Go are really happy. They have reported this solution to be working. Hence, we thought of sharing this solution with all the other visitors around the world. This will help you play Pokemon go again without any errors. You can catch more Pokemon in Pokemon Go and if lucky, a legendary Pokemon. Check the legendary Pokemon Go locations here. How To Solve Pokemon Go Unable To Authenticate Error? So, if I’m not wrong you’re facing this error because you’ve been signing up on Pokemon Go with Pokemon Trainer club in Pokemon GO. Half of the problem gets fixed if you find this true. The problem lies with the fact that a majority of the people playing Pokemon Go have registered using Pokemon Trainer Club. This has simply overloaded the already limited capacity servers which gives access to Pokemon Go players in the world. Hence, it is very logical that you’re getting an unable to authenticate Pokemon Go error. But this can be solved by following a simple guideline. What you need to do is, instead of signing up with Pokemon Trainer Club, sign up with Google. Yes, just below the option of signing up with Pokemon trainer club, you will find an option to sign up with Google. So, next time when you start the game just go ahead and sign up with Google. I’m sure you won’t get any error like unable to authenticate Pokemon Go. The solution works because the servers which host player signed up via Google are less crowded as compared to the server that host player signed up via Pokemon Trainer club. Hence, we can just shift ourself from a really congested server to the servers where there is room for more Pokemon Go trainers. I hope I was able to solve your problem. 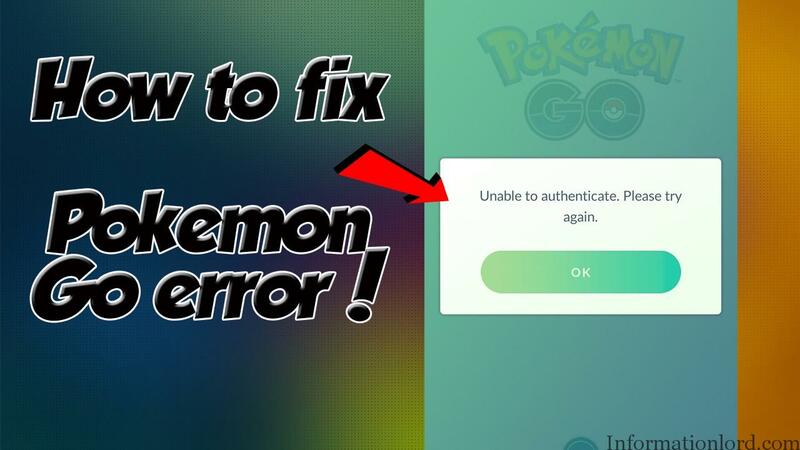 If you still are not able to solve the Pokemon Go unable to authenticate server, then do comment below so that we can try to find any other solution. Enjoy! Tech Blogger and Android Expert who loves surfing Internet and finding new tech stuff and frame new articles over the same and help the world with the knowledge attained!